NIU President Lisa Freeman speaks at the Oct. 9 news conference announcing the creation of the Northern Illinois Center for Community Sustainability, as Gov. Bruce Rauner looks on. A world-class research center targeting food systems, water resources and environmental change is planned at Northern Illinois University as part of a new statewide innovation network led by the University of Illinois System. The Northern Illinois Center for Community Sustainability (NICCS) will be housed in a $22.9 million facility to be built on NIU’s far west campus. 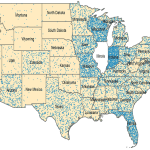 As the fourth hub of the Illinois Innovation Network – and the first outside of the U of I System’s three universities – NICCS will be part of a statewide network aimed at driving economic growth in Illinois and addressing critical global issues. As announced today by U of I System President Tim Killeen and NIU President Lisa Freeman, about two-thirds of the new building’s cost, or $15 million, will be financed from the $500 million in state capital funding approved last spring to launch the innovation network. NIU will provide the remaining $7.9 million through in-kind contributions, private investment and donations. The facility is targeted for opening in fall 2021. “NIU is proud to partner with the University of Illinois System and to expand the Illinois Innovation Network. 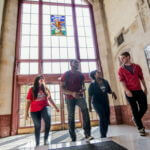 Our hub will have significant academic, cultural and economic impact,” said NIU President Lisa Freeman. At the Oct. 9 event announcing the creation of NICCS, Gov. 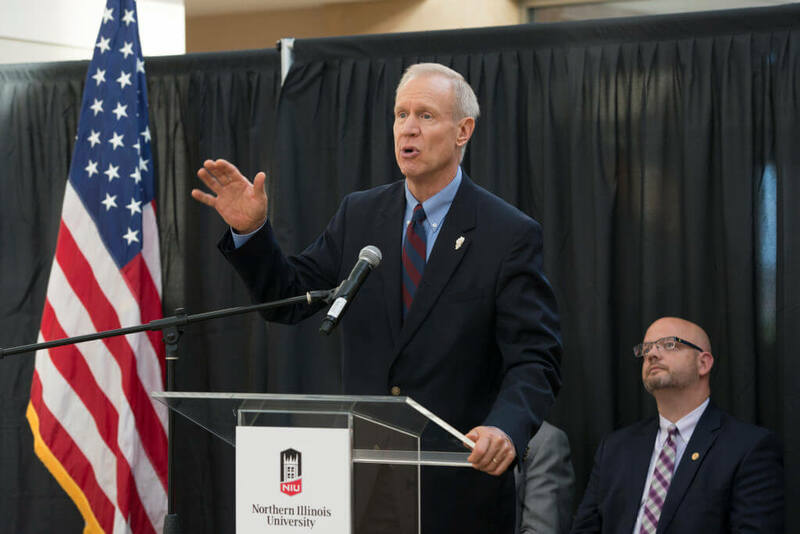 Bruce Rauner heralded the partnership as an important part of efforts to strengthen the Illinois economy. “The Northern Illinois Center for Community Sustainability will create locally based innovative solutions focused on improving food systems and water resource management in a world facing shrinking natural resources, changing climate, and increasing urbanization. The center will support interdisciplinary research, policy development, and public-private partnerships to stimulate economic development and job creation, as well as to attract and develop talent,” she said. Killeen said the new research center will capitalize on NIU’s leadership in community sustainability and the environment, and the innovation network will help spread its impact to every corner of the state. “This reflects the core of the innovation network’s power – focusing the great minds across our state on real-world challenges to spark the discovery that will move Illinois forward,” Killeen said. 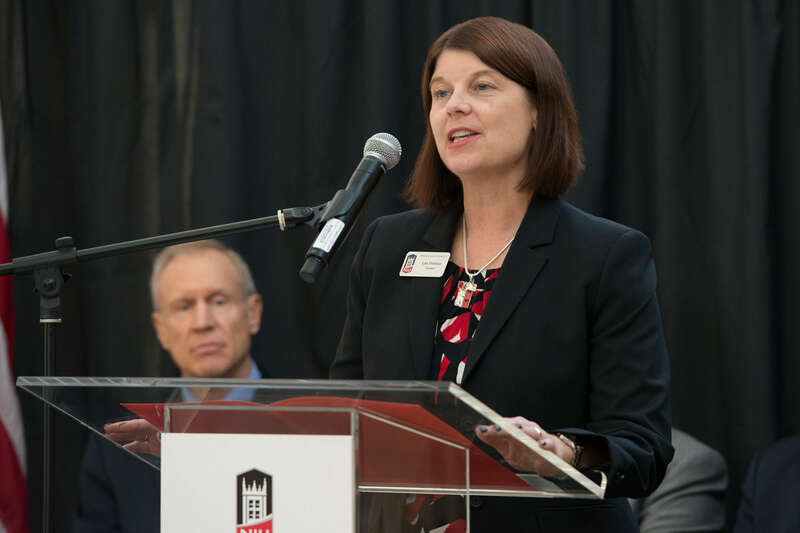 NIU’s new center and those at other regional hubs throughout Illinois will be virtually connected to the network’s centerpiece – the Discovery Partners Institute (DPI) in downtown Chicago. Led by the U of I System, DPI will be home to more than 100 world-class researchers and thousands of students pursuing economy-building discoveries. Core focuses of the statewide research enterprise will include advances in food and agriculture to help feed a growing world; environmental and water innovations that protect natural resources and provide for a growing population; improvements in the use of “big data” and computing technology, including cybersecurity and the “internet of things;” and healthcare breakthroughs including new drugs and treatment methods. The NIU hub will focus on the first two themes related to food and environment. NICCS work will be supported by a collaborative partnership between NIU and the College of Agricultural, Consumer and Environmental Sciences (ACES) at the University of Illinois at Urbana-Champaign, as well as governmental agencies and the private sector. DPI will be developed on a donated site along the Chicago River, and will bring together top faculty from the U of I System and partner universities, including NIU, the University of Chicago, Northwestern University, and Tel Aviv University. Researchers will connect with hundreds of businesses, thousands of students, and many entrepreneurs and venture capital firms. DPI’s research and educational collaborations will address real-world challenges, promoting the kind of breakthrough discoveries that create new products and companies. At NICCS in DeKalb, all initiatives will be supported by multidisciplinary teams that cross many NIU academic areas. For example, NICCS work on environmental issues will be supported by an allied policy institute to recast research findings into policy options for local communities. Similarly, NIU plans to establish an environmental law clinic to help students gain real-world experience representing people whose health, safety and welfare are directly affected by environmental issues. About the University of Illinois System: The University of Illinois System is a world leader in research and discovery, and the largest educational institution in the state with nearly 86,000 students, nearly 25,000 faculty and staff, and universities in Urbana-Champaign, Chicago and Springfield. The U of I System awards more than 22,000 undergraduate, graduate and professional degrees annually. About Northern Illinois University: NIU is an engaged, public research university, widely recognized for success at public engagement, high-impact research, and advancing the social mobility of students from diverse backgrounds. Offering undergraduate, graduate and doctoral degrees at its main campus in DeKalb, and at outreach centers in Naperville, Rockford, and Hoffman Estates, NIU enrolls approximately 18,000 students and awards nearly 5,000 degrees annually. 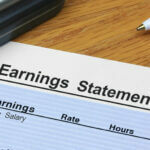 Next story $5 million in new scholarships!